By now, most of us have seen and been slightly intrigued by the Apple Watch, only to ultimately realize that it is way too expensive and actually rather pointless. However, it does possess one advantage that hasn’t been as widely publicized as its other technical innovations, which could prove to be a huge incentive for moviegoers. That’s because the Apple Watch will allow you to look for movie showtimes and offer up the availability of scannable movie tickets on your wrist. All of this is due to Fandango and Apple’s recent agreement, which will result in the ticket service being responsible for one of the first apps that Apple Watch will make available to its customers. 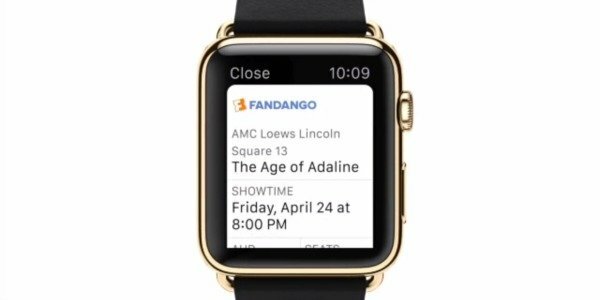 Apple Watch will be released on April 24th, which is perfect timing for Fandango users too, because that’s just a week ahead of Avengers: Age Of Ultron’s release on May 1st. But what will the Fandango app feature that will make it unique? Fans that purchase their tickets from the service will get a mobile barcode ticket delivered straight to their Apple Watch. Then all you have to do is show the Apple Watch app to the individual scanning tickets at your theater, and you will instantly gain entry to your screening. As long as you’ve kept your Apple Watch charged, that is. I have to be honest: I didn’t realize that there was actually an issue with the old way of ordering tickets, but clearly the powers that be over at Apple and Fandango know more than me. When you consider the fact that the cheapest Apple Watch available will still set you back $349, I’m still not 100 percent convinced that they’re worth it. And don’t get me started about the $10,000 version, because unless it can sprout wheels and drive me straight to the movies and back, I’m not interested.